1 What is the Internet Health Report? What is the Internet Health Report? The Internet Health Report is Mozilla’s open source initiative to document and explain what’s happening to the health of the Internet. The report’s goal is to provide a compelling, credible and broadly accessible source of information on the state of internet health. The report is meant to serve both as a touchstone for people working to improve internet health and as an ‘issue platform’ that informs the work of the Mozilla community and our allies. The long-term goal for the Internet Health Report is to become the human-centred, open source alternative to voices like Mary Meeker. Instead of providing a narrow Silicon Valley industry view, it sums up the research and initiatives of internet health leaders from around the world. The Internet Health Report’s primary target audience, as both readers and contributors to the report, are internet health professionals working day-to-day on internet health topics, and activists who work on internet health issues in their spare time. 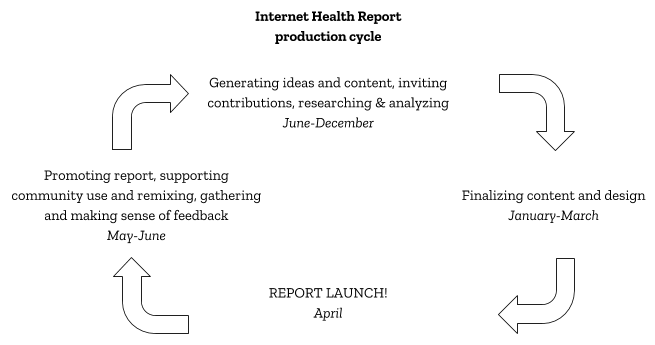 The Internet Health Report is an annual, standalone publication, and a resource that can be remixed and repurposed in support of related initiatives. The report is focused on internet health, and in particular five issues that Mozilla is focused on: Privacy and security; Openness; Decentralization; Web literacy; Digital inclusion. The report’s content highlights human stories, research, and data, drawing on the internet health community and the research and thinking of Mozilla’s allies. If needed, Mozilla may also commission original research for the report. The Internet Health Report is currently released each April. The ideation process for each report will be open to everybody interested in contributing, and we will encourage and offer various channels for such contributions. To improve the quality of the report and benefit from picking “the collective brain”, as well as encourage engagement and debate over the internet’s health issues, the report will be developed in an open process. Over 200 people directly contributed to creating the 2018 Internet Health Report by writing, reviewing, researching, discussing and designing. Many more also gave feedback on the 2017 Internet Health Report and participated in the public crowdsourcing process "How would you measure the health of the Internet? ", all of which also informed the 2018 Internet Health Report. Solana Larsen, Internet Health Report Editor. Kasia Odrozek, Internet Health Report Project Manager. Jairus Khan, Internet Health Outreach Coordinator. Sam Burton, Director, Insights at Mozilla Foundation which is home to the IHR. Our extended staff team at Mozilla consists of many more across MoFo and MoCo who we involve on a temporary basis. To get in touch, email internethealth@mozillafoundation.org with the person's name in the subject line. If you’re not sure who to contact, reach out to Kasia and she’ll help you find the right person! There are two tiers of readers we are targeting with the Report. Our primary reader audience is people likely to use the report as a resource: members of the internet health movement. In the secondary reader audience is media. We want them to share and promote the report in their networks. Academics who research internet health-related topics. The primary format for the report will be a multimedia online publication, connected to Mozilla’s website. It will be easy to navigate, sharable and visually appealing. The language will be non-jargony and accessible, yet densely meaningful and expressing political urgency. In addition to the web version, we will also provide a downloadable PDF version of the report. Research based analysis and data visualisations on internet health’s indicators providing a benchmark and evidence on the current state of the internet (opportunities and threats/healthy and unhealthy). Compelling, accessible narratives about what’s healthy and unhealthy that contextualizes the data by explaining why these issues matter to the future of the internet, and to the people who use it. All elements will be bound together with a visual storytelling format that makes for a coherent reader’s journey. Both the Report and the website will be available in several languages (in 2017/2018: English, German, French, Spanish). We seek contributions from a range of people: subject matter experts, thought leaders, internal Mozilla stakeholders and community members, feature writers, professionals and activists. To be able to process the contributions in a systematic way, we work along a contributor's framework, where some contribution opportunities are open to all and others are invite-only. We’re immensely grateful to everyone who helps to create this report! In public or private meetings/conferences/gatherings/dinners we will ask people whose opinion we value to act as a sounding board to the idea of the report in general, as well as on the specific content and formats ideas. The report is a great conversation starter about “Internet health” in general. We have guide & materials that can be adapted by anyone, and will assist anyone interested in hosting a conversation about how “Internet health” framing can be adapted for policy, planning or research in a local context, perhaps even in the form of local (or topic specific) health reports. We need help from contributors around the world (and speaking different languages) to send us research they find particularly insightful and interesting on various aspects of Internet health. Apart from helping us to identify new studies to include in the report, it will help us expand our “vocabulary” of Internet health into geographical regions we don’t know as well. We received dozens of emails, comments and feedback submissions through the website with ideas for metrics to include in future versions, or things to do differently on the website. This is helpful, and we hope to expand on encouraging more engagement via the site. If you have questions about the contribution opportunities by invitation, please contact Solana. We invite you to use, localize, translate and have fun with these materials! Share them with us or add them below so that others can use them as well. Before you get started, read the IHR Design Asset User Guide. If you make something, please add it below! This page was last modified on 26 November 2018, at 16:13.